On the two-year anniversary of the inauguration of Dictator Donald Trump, approximately 200,000 people attended the 45th anti-abortion “March for Life” in Washington, D.C. VP Mike Pence spoke, telling the audience to “stand with that love and compassion.” Both he and Dictator Donald Trump (DDT) emphasized the importance and equality of “every life,” meaning only fetuses and newborns, probably white. 23.8% of clinics experienced the most severe types of threats and violence in the first half of 2018, including death threats, stalking, and blocking clinic access. 45% of clinics experienced at least one incident of severe violence, threats of severe violence, and/or severe harassment, such as break-ins, robberies, or vandalism, in the first half of 2018. Clinics that rated their experience with law enforcement as “poor” or “fair” were twice as likely to experience high levels of severe violence or harassment (28%) than those that rated local law enforcement “good” or “excellent” (15.1%). These are the only businesses in the United States that suffer these levels of threats and violence. According to the trend, women will gain equality to men in 165 years—2183. Today is the third Women’s March. The first one brought out 4 million people in hundreds of places around the world. 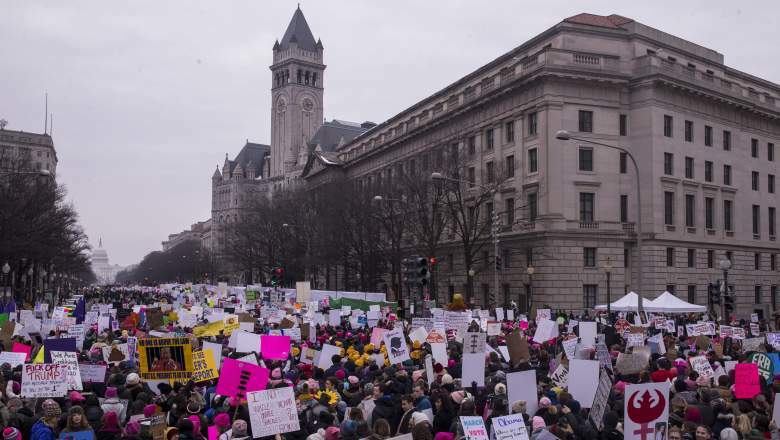 The protest goes far beyond just “women’s issues”: it includes rights for racial justice, LGBTQ people, immigrants, workers, voting, and the disabled as well as issues such as economic justice, liberties, and protection of environment and climate. Specific priorities include universal healthcare, the Equal Rights Amendment, end of war, student debt, and de-militarization of the U.S. borders. Problem solving improves with more women because it benefits from diversity of gender, ethnicity, race, sexual orientation, and gender expression. 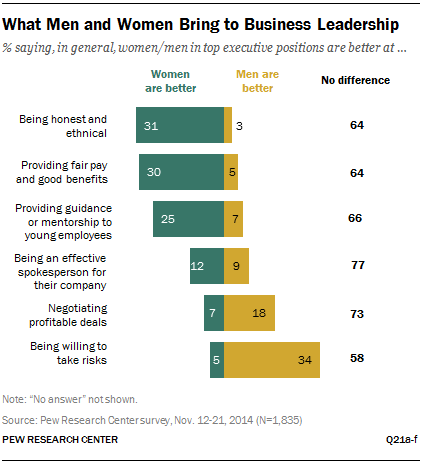 Workers have more trust in female leaders, according to a Pew survey. In 2015, 34 percent said women are more honest and ethical whereas only 3 percent is better in this area. Women make good mentors, according 30 percent in the Pew survey. Only 5 percent thought that men were better mentors. Millennial women are more educated than men, and education is important in challenging the status quo, introducing new business approaches, and implementing innovative techniques. “Justice is not a concept we read about in a book. Justice is about the water we drink, justice is about the air we breathe, justice is about how easy it is to vote, justice is about how much ladies get paid. “Justice is about making sure that being polite is not the same thing as being quiet. Reports show that this year’s marches were smaller than the millions of the past, perhaps from bad weather, less interest, or the fracturing of he organization from accusations of anti-Semitism for the leaders. Yet hundreds of thousands of people in over 300 cities showed up in freezing rain across the United States. For the past two years, the marchers have been active—attending town halls, protecting the Affordable Care Act, supporting teachers on strike, campaigning for progressive candidates, electing women, and protesting to save the dying planet. https://www.cnbc.com/2019/01/03/these-are-the-women-making-history-as-the-116th-congress-is-sworn-in.html In the midterm elections, the first since the inauguration of the annual Women’s March, 102 women won their races for the U.S. House, shattering the previous record of 84. Eighty-nine of these winning women, Democrats, represented ethnic and religious diversity. Women will chair six influential House committees. Over 20 of the 36 newly-elected women—all of whom replaced male incumbents—are first-time political candidates. One-fourth of the Senate is female, 17 Democrats and 8 Republicans. In Congress, 28 are mothers of younger children, causing the installation of infant changing facilities in the members’ restrooms. Yesterday, a group of indigenous people protesting at the Lincoln Memorial were interrupted by 50 to 70 DDT-supporting who chanted “build the wall.” One of them, a white teenager wearing a MAGA hat, harassed an indigenous elder, Nathan Phillips, who served in Vietnam and participated in surrounding and jeering at the protesters. The young man came from Covington Catholic High School (Park Hills, KY), an all male schools of 560 students with a their mission to “embrace the gospel message of Jesus Christ in order to educate young men spiritually, academically, physically, and socially.” Singing the American Indian Movement song that serves as a ceremony to send the spirits home, Phillips, 64, said that he continued his drumming and singing by thinking about his wife, Shoshana, who died of bone marrow cancer nearly four years ago, and the threats that face indigenous communities. 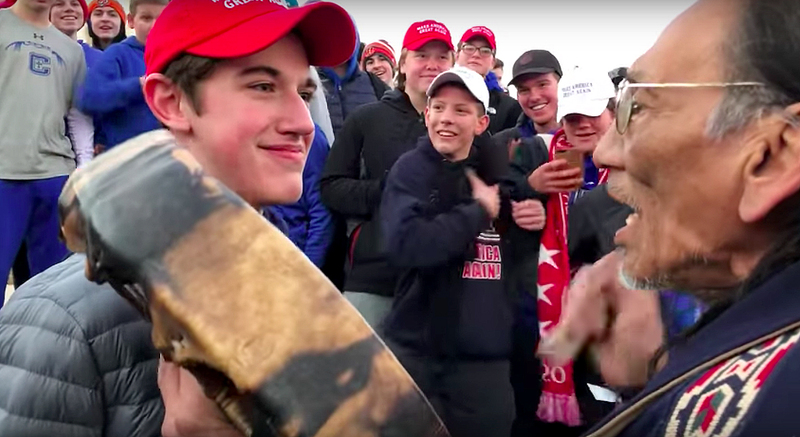 Covington students each paid $130 for the field trip to the March for Life before they moved on to abuse the indigenous protesters, and the students’ parents and chaperones did nothing to intervene in the students’ behavior. This past week, DDT mocked horrifying massacres of Native Americans. Day 29 of the government shutdown: Just before the Women’s March for justice and reproductive rights, House Speaker Mitch McConnell (R-KY) ignored the House bills on the grounds that it would waste the Senate’s time “on show votes.” Last Thursday, McConnell failed to get the 60 necessary votes for his first anti-abortion bill of the 116th Congress, something he knew would happen. Opponents to women’s reproductive rights did show up to Washington—some of them to harass a Native American veteran and elder. McConnell plans to put another useless bill onto the floor of the Senate–this one DDT’s proposal that the Democratic House has declared DOA. DDT is still stuck in his corner, and the economy is tanking from the government shutdown.